Any time is a good time to start crafting and creating Valentine's Day decorations for the coming year. Some of the ornamental decorations can be made very quickly, at the last minute, though it's always nice to start ahead a bit if you can so that you have time to think about what you are making, why you are making it, to think about the person you are making it for if you are doing so for someone else...it's just nicer to be able to relax and enjoy what you're doing. No matter what handcraft you prefer, I hope you enjoy the ideas provided on this page. And if you are visiting close to Valentines Day, I hope it is a special day for you and those you love. 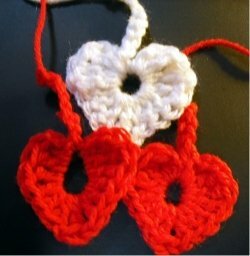 Here is a picture of my first attempt at crocheting very simple Valentine hearts. I tied them together and tied a poem I wrote for my husband into a scroll with them on Valentines Day a few years ago. Here is what you will need to crochet the hearts pictured here and below. In the 4th chain from hook (4 stitches will be part of the tail/hanger) 3 TR to Chain 2 (17 stitches including the chain stitches). Slip stitch into the top of the heart, Slip stitch into the chain at the left point of the heart. SC 1 in next chain. 2 DC in each of next 3 stitches. 1 DC into each of next 4 stitches. At the bottom of the heart, 3 DC in same stitch. SC 1 in next stitch. Slip stitch in last 2 stitches. This should bring you to center of heart top. Tie the two chains together and cut tails. 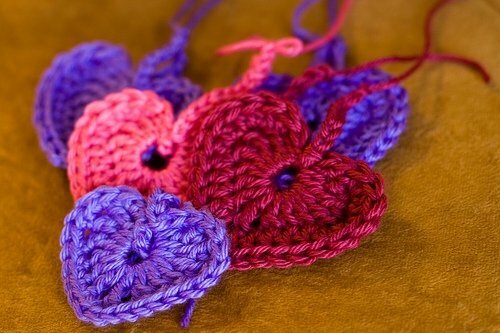 There are many beautiful hearts that you can crochet at all levels of difficulty, depending upon your skill. My favorite way of finding a heart to crochet is to do a search online and then click the "images" link and look through until I see something I like. I then click on the image, and look for "visit page" in order to find out whether the pattern is available online, and whether it is, indeed, free. Here is a link to Valentine's Day Heart Images on Google. It is the result of my search on Google. Here is just one example of an easy heart pattern, like the one written out above. I hope you enjoy my very simple pattern. I did originally find it online, but I searched and searched to see if I could find the post to give credit where credit is due. It appears that the original site is no longer there, it used the following beautiful image. I see another site using this image, but it is not written in English. But isn't the following picture beautiful? If the original owner stops by, please let me know so I can give you proper credit. To visit my other Crochet pattern pages, click here, or click "Crochet" toward the top of the right margin. Please feel free to ask any questions or say hello in the comment section below.